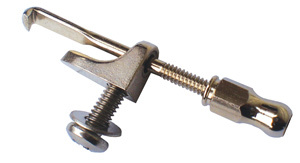 Banjo hardware and parts can be specialized or rather commonplace. When it comes to vintage and hand crafted banjos there is a good deal of variety. Most modern banjo hardware cannot be found in the hardware store and so must be ordered. Become familiar with the hardware before you begin building a banjo. Find out the dimensions of the parts that will be fit directly to the wood of the banjo, such as, the tuning machines, the shoe bolts, and the neck brace. Knowing the dimensions of your hardware will help you make the wooden parts correctly. Purchasing some banjo hardware is a sure way to learn exact dimensions. Following is a detailed list of the usual hardware that is currently widely available through catalog and online suppliers. In ages past the banjo often featured friction pegs. These can still be found on violins and some gourd banjos made today. Friction pegs are seldom featured on steel string banjos. With the industrial revolution wooden friction pegs gave way to machined friction pegs, the friction in this case being created by a screw. 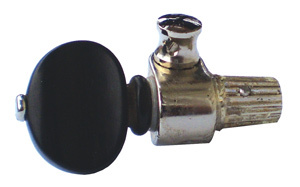 Later, machined friction pegs gave way to the modern geared machine tuner. Most modern banjos feature geared tuning machines that, unlike guitar tuners, protrude straight back from the peghead. There are a few different makers of modern tuners. 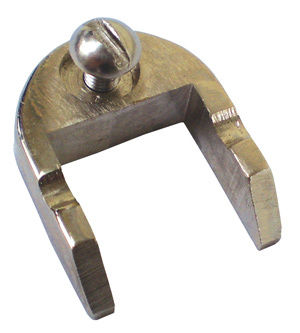 There are also tuners available which have the look of a friction peg but are actually cleverly disguised geared tuners. The fifth peg tuner also deserves mention here. It is a special tuner that is pressed into the side of the neck at the place where the fifth string begins. Most of them are geared, but I have seen some that were of the friction type. The End Pin Screw holds the other end of the dowel stick firmly against the inside of the rim. 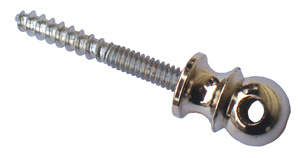 One end of the screw has wood threads and the other has machine threads and a little brass ball that screws onto it. The little ball has a hole in it that allows the tailpiece to fasten to it. Hooks are threaded on one end and feature a hook on the other, they hold the drum part of the banjo together and come in two varieties, round and flat. 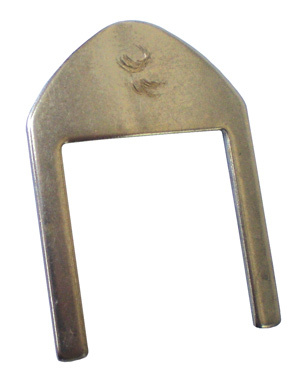 This distinction refers to the shape of the hook part of the hook. The round hook is used with the notched tension hoop, and the flat hook is used with the grooved tension hoop. It is of course possible to use one for the other but the results are not as good. The hooks are one half of a working fixture, the other half is the nut which threads onto the hook and holds it onto the shoe and allows for tightening the head. Nuts are available in a variety of sizes and shapes. There are open end nuts and closed end nuts. They play a role in planning because it is nice if the ends of the threaded hooks do not protrude out the back of the nut. Sometimes a hook may have to be cut short so that it does not stick out. Shoes sometimes called L-shoe brackets are pretty standard. The shoe bolts to the rim, and the hook to the shoe. Most modern shoes have a 12-24 thread size. Some older banjos feature a round shoe, some even feature die-cast shoes in the shapes of animals or other decorative elements. There are considerations to be made when choosing the placement of the shoe on the rim. If the shoe is placed without enough space between its top edge and the bottom of the tension hoop the head will not be able to be fully tightened. The bolts that fit the shoes are often 12-24 thread size as well, in any case they must match the shoe that they hold on. The bolts that come with the shoes are usually too long for the thickness of my rims. Sometimes I cut them down to size with a saw and smooth down the rough ends on the grinder. More often I order some machine screws that are the right length. 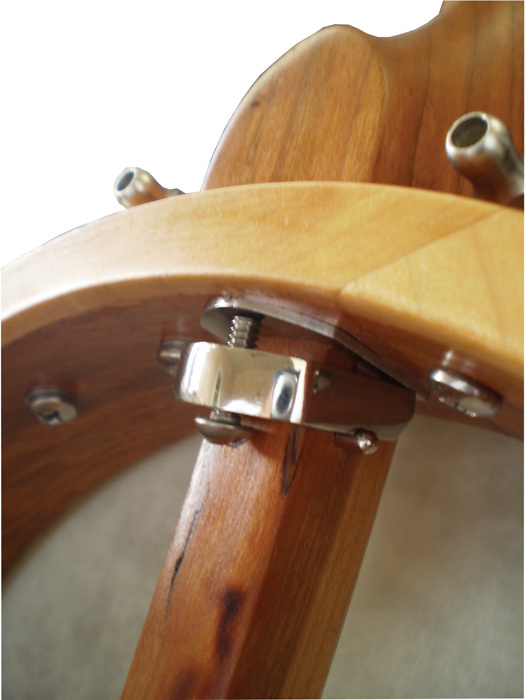 The Neck Brace is a great piece of banjo hardware to have and facilitates the use of a wooden dowel. The brace pulls the heel of the neck snugly against the rim. It also allows the application of additional pressure as the instrument settles. The neck brace consists of four parts, the brace, the screw, a plate, and a pin. The pin mounts into the dowel stick through a small hole drilled just for it, called the pin hole. The pin hole need not be an overly tight fit. The location of the pin hole is essential to the operation of the brace. The brace itself straddles the dowel and uses the pin as a fulcrum by which it can pivot and apply pressure. The brace also has a threaded hole for the screw. The screw is tightened to pull the neck snug. The plate sits on top of the brace, between the screw and the rim and gives the blunt end of the screw and the legs of the brace something solid to bear against, preventing it from marring the inside of the rim. The plate of the neck brace. This just gives the body of the brace something to bear against so it does not dig into the wood of the rim. The brace pin is inserted into the side of the dowel stick through a small hole. The pin gives the body of the brace something to pivot on. Here we can see the neck brace in action.